As an FCO Board Member, I am privileged to observe first hand the good work of our Club and Foundation Boards. They work hard behind the scenes to keep our Club vital, interesting, rewarding, and financially sound. 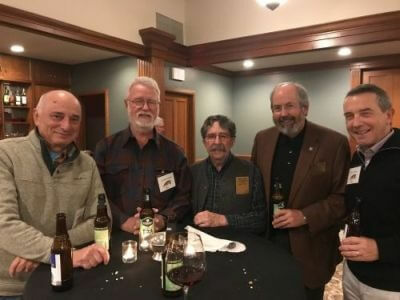 And 2019 promises to be a great year to be a member of the Flyfishers’ Club of Oregon! Along with the terrific monthly meetings, we have fishing excursions, new publications, another great auction, and membership outreach in the works. Our Club depends on you to help continue our legacy to promote the art, science history, and literature of fly fishing. Thank you for bringing new members, contributing to the auction, attending the meetings, volunteering to help with outings and events, offering your ideas, serving on one of the boards, and renewing your membership each year. You are the reason the FCO has remained true to its mission for nearly 58 years! Thank you for your support and remember to renew in 2019! L – R: Members Mark Seligman, Jay Beckstead, Barry Mayer (non-resident member), Mark Metzdorff, and Jerry Brown. Barry visited from his Vermont home in November. John ‘Jay’ Fewel -The FCO lost another member on October 13, 2018 when John ‘Jay’ Fewel moved on to eternal waters. Jay was a long time member of the Club and joined his late father, John ‘Jock’ Fewell as a regular at meetings and on the river. Mr. Fewel was a senior investment officer for the State of Oregon and helped navigate the state’s PERS investments through the turbulent times. In addition to his love of angling, Jay loved cooking, hunting and crabbing. We will miss Jay and send our heartfelt condolences to his wife, Kerrie, and family. Craig Murphy – The Flyfisher Foundation gratefully received an unexpected group of donations in memory of 72 year-old Portland attorney, Craig Murphy. Mr. Murphy was an avid fly fisherman and outdoorsman who plied the Deschutes and climbed mountains in Nepal. He passed away on September 9, 2018. His family requested that remembrances be sent to the Flyfisher Foundation and the Foundation has received $2350 in Mr. Murphy’s name. At the Flyline’s press time, we have been unable to determine if Mr. Murphy was ever a member of the FCO. Nevertheless, we truly appreciate the donations and celebrate the rich life of a fellow angler.